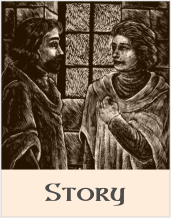 Eight hundred years ago, a French scribe recorded the tale of two knights, how they met on the field of combat, and how hostility turned to love. For centuries, writers mined other riches from the trove of Arthurian lore, but this remarkable story was long forgotten. The scattered elements of this legend have now been assembled from a massive Old French text and retold here for the first time in English. 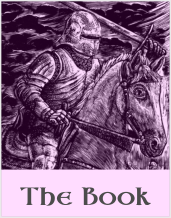 Not since the Middle Ages has the heroic love of Lancelot and Galehaut so vividly sprung to life alongside the romance, jealousy, and betrayals of Arthur and Guenevere. This is a powerful tale of honor and conflicting loyalties, of prowess in battle and of magic spells, of devotion even unto death. Although the story has crossed a great chasm of time, we can recognize our own world in the enchanted space of King Arthur and Queen Guenevere, the mysterious Lady of the Lake, the matchless Lancelot, and Galehaut—Son of the Giantess, Lord of the Distant Isles. 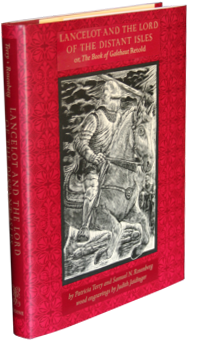 Alongside the deeply resonant love story of Sir Lancelot and King Arthur's wife, Queen Guenevere, the Book of Galehaut tells us that Lancelot's extraordinary prowess and physical beauty inspired the love of Arthur's powerful foe, Galehaut, Lord of the Distant Isles. Samuel N. Rosenberg and Patricia Terry are both seasoned scholars and translators of medieval romance. Patricia Terry taught French and comparative literature at Barnard College and California/San Diego. Samuel N. Rosenberg is a Professor Emeritus of French and Italian at Indiana University. 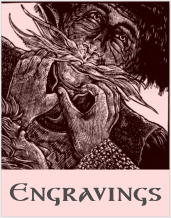 Judith Jaidinger's wood engravings complement the narrative with deeply moving and evocative wood engravings. This gallery contains examples of these fine illustrations by one of America's leading wood engravers. 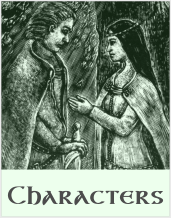 This story, adapted from Old French sources, introduces the familiar characters we know from the much later Malory and The Once and Future King. Arthur, Lancelot, Guenevere are joined here by Arthur's great adversary Galehaut, the Lord of the Distant Isles. 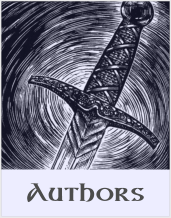 Read excerpts from the book and a review from Arthuriana by Donald L. Hoffman. Listen to Samuel N. Rosenberg reading a number of passages from the book as well.